HIX Corporation recently tested two equal wattage machines; a stock HIX heat transfer machine with no black PTFE non stick coating on the heating element and one with the Black PTFE non stick coating applied to the heat element. We hooked up a voltage meter to both machines to measure how much electricity it takes to operate each machine and we discovered that the non coated heat element on our standard stock heat transfer machines used 43% less electricity to operate than the heat press with the Black PTFE coating! How can this be true? The answer is simple and it's called physics! In physics there is a phenomena called "Black Body Radiation" where it is scientifically proven that the color black not only absorbs more IR heat, it also casts off more IR heat if the object generates heat like that of our aluminum heating element. Science doesn't lie and the proof for the customer will be a cooler work area around the machine, and lower energy bills each month! Another energy saving benefit by running the HIX machine is the fact that since less heat is cast into the work area from the heat element, this will reduce the need to run the air conditioner as long in the shop to cool the work area! This lower air conditioning bill will be noticed at the peak of the summer season. Another proven fact is that HIX heat castings are the longest lasting heating elements available on the market and this eliminates the need to send the press to a land fill since it keeps doing its job year after year! If you want to lower your energy bills and at the same time to do your part to lower your shops carbon footprint to help the environment, the HIX Heat Transfer machine is the perfect solution! GO GREEN ...GO HIX! 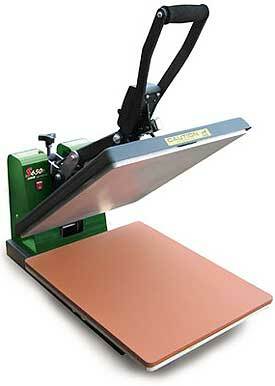 Note: The all black heat presses that you see on our site today have the energy efficiency as stated above. In the near future Hix heat presses will be painted in a green and black two tone combination like you see in the picture above.